The death toll from Tuesday's violence in central Cairo has risen to two, a health ministry official has told Ahram Online. A 25-year-old man died in hospital on Wednesday from birdshot wounds to his chest, stomach and head. The first death, of a 20-year-old man, was also caused by birdshot wounds. 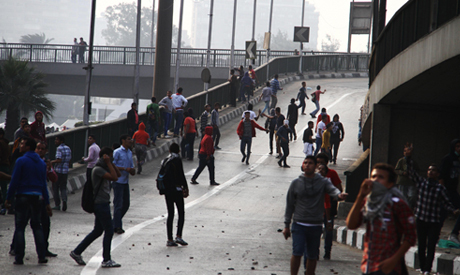 Fifty-one people were also injured during nationwide protests marking the second anniversary of the Mohamed Mahmoud clashes. Clashes erupted in Tahrir Square early on Tuesday between supporters and opponent of army chief Abdel Fattah El-Sisi, who led the ouster of Islamist president Mohamed Morsi in July amid mass protests against his rule. Clashes resumed at night between anti-military protesters and security forces near the Arab League headquarters on the edge of Tahrir Square. Riot police later fired teargas at stone-throwing demonstrators to drive them from the square. Tuesday's protests marked the second anniversary of deadly demonstrations against the then-ruling Supreme Council of the Armed Forces. Some 47 people were killed and at least 3,000 wounded during days of street battles between protesters and police in November 2011. The violence was the first real challenge to the military junta which assumed power after the overthrow of Hosni Mubarak. On Wednesday, prosecutors began questioning 30 protesters arrested on Tuesday for rioting, assaulting policemen and attempting to storm the Arab League headquarters, judicial sources said.